Identification methods of nonlinear parameters are developed to characterize solid materials and soft tissues. In the frame of classical parametric interaction methods, the parameter evaluation is based on the measurement of quantities related to the acoustic wave propagation medium. They appear at frequencies combinations and/or multiple harmonic of primary wave frequencies, and are generally weak in comparison to the amplitudes of the sources. Hence, the use of experimental devices excited at high amplitude levels is required. 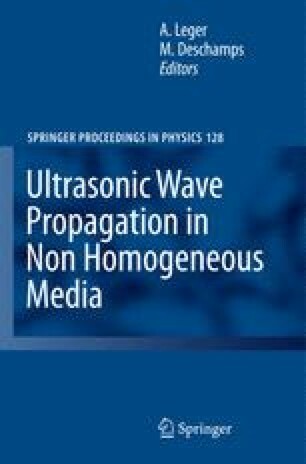 One problem in the identification of nonlinear parameters is that the ultrasonic device itself is not exempt of nonlinearity. Generally speaking the problem is to ensure, for each specific configuration, that the involved instrumentation (waveform generator, voltage amplifier, transducer), the coupling medium, mutual interactions between many sources… do not perturb the evaluation of the investigated nonlinear effects.